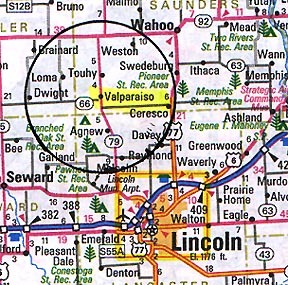 Unusual cattle deaths occurred in Valparaiso, Nebraska, about 25 miles northwest of Lincoln, on April 5 and 7, 2003, and January 9, 1994. April 19, 2003 Valparaiso, Nebraska - About 25 miles northwest of Lincoln, Nebraska, is the small ranching community of Valparaiso. There are some 145 residents and the Mike Benesh family has a ten acre pasture where they've raised 50 head of cattle. Until the early morning of April 5. That's when the Beneshes discovered three of their animals dead. Two were cows in their second year. The third was a 2-month-old bull calf. One of the cows was kneeling upright with all four legs under her. There were no cuts, bruises, blood or signs of struggle. But there were burn blisters in the roof of her mouth.